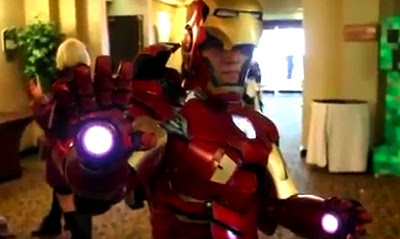 Having already created suits of War Machine and the Mark V and 'Hulkbuster' Iron Man armours, Anthony Le aka 'Master Le' might just be Earth's Mightiest Cosplayer. He has even taken to wearing his various suits to children's hospitals and at fundraisers to help homeless children. You can visit his website here, after the jump. Damn! Wish I had that armor. Too bad it or maybe fortunate for us it's not functional! HOLY FU@#$% SH&$!!!!!! THAT IS AWESOME GREAT FIND DAN! Thanks Dave! On his website he has video diaries about his creations and he's so humble and bewildered by the response they've generated it's nice to see. Me? I'd be showing off to anyone who'll listen!! Dale - you and me both. tell ya what. you grab Iron Man's I'll borrow War Machine's and we'll go cow tipping or something.